JP Morgan Asset Management published two interesting charts in last week’s “US Fixed Income Markets Weekly. You can see the spikes that occurred in 2010 and 2011 that correspond to the times when the Greece/Europe debt crisis flared. The most recent concerns about Greece defaulting and Spain and Italy coming under the microscope with rising bond rates are not reflected in as large an interest in Google searches for “recession”. 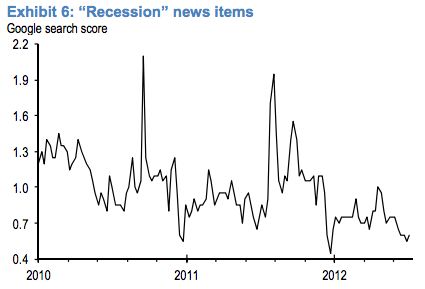 Maybe that is just Europe fatigue, and maybe it is a reduced sense of concern about a recession. Whichever, in the short-term, expectations drive securities prices, although in the long-term reality and experience determine price levels. “Many commentators argue that uncertainty about taxes, government spending and other policy matters deepened the recession of 2007-2009 and slowed the recovery. 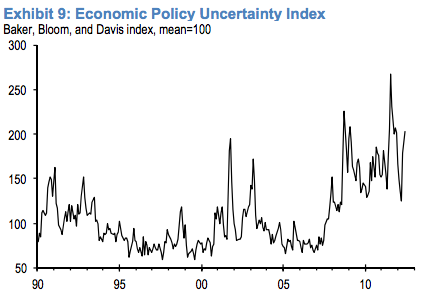 To investigate this issue we develop a new index of policy-related economic uncertainty and estimate its dynamic relationship to output, investment and employment. The spikes in uncertainty seem to occur at times when the stock market is weakening, although their is not a proportional relationship. You can see that the highest spike occurred in 2011 (around the time of the European debt crisis), but the deepest stock market decline was in 2008, when the second highest uncertainty spike occured. All we can gather from the chart at this point is that there seems to be a directional signficance to the indicator, corresponding to the common sense view that more uncertainty is a negative for stocks and less uncertainty is a positive for stocks. Uncertainty has been rising as of late with not only the European issues, but the close US presidential race towards two potentially very different futures, the US fiscal cliff specifically (taxes and spending at the federal level), slowing GDP growth in China, continuing tensions in the Middle East (with Syria becoming the center of major diplomatic struggles between the major military powers), recent territorial conflicts on the high seas between China and its neighbors (Japan, Vietnam and the Philippines). 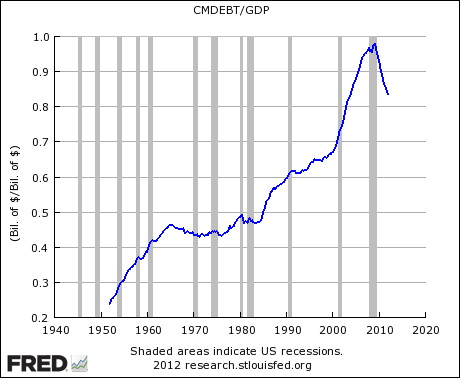 The index is not as elevated as it was in 2011 and 2010 when the European debt crisis flared. It has risen slightly from its 2012 low, but is still subdued compared to the peaks since 2007. However, it has not reached the lower levels of comfort seen during the bull stock market from 2004 through 2007. 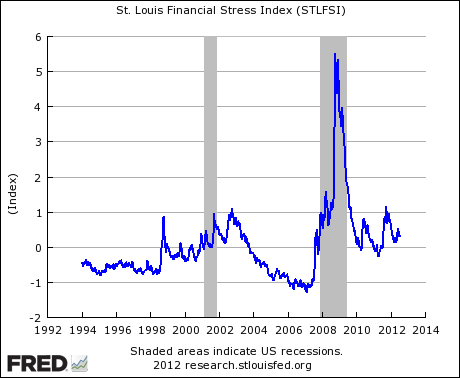 One of the components of the St. Louis Stress index that we like to view independently is the VIX. The VIX is not showing distress. It is much lower than during the Europe crisis in 2011 and 2010, and is in no way similar to the panic seen at the time of the 2008 crash. 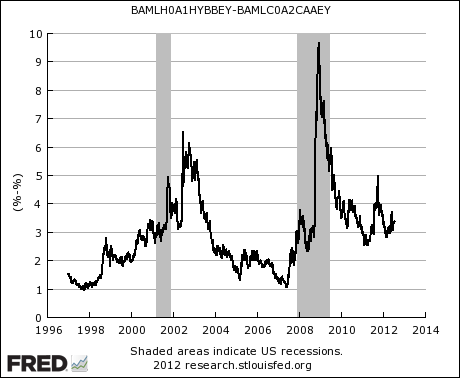 The current level is somewhat below the 10-year average level (shown as blue line). Another indicator we like to look at is the yield spread between the highest level of below investment grade corporate bonds (rated BB), and the next to highest investment grade corporate bonds (rated AA). As that spread rises, it correlates with economic forecasts worsening (because investors demand relatively more yield from weak companies than they do when things are going well with the economy). When the spread declines, the forecasts are improving. The spread is much better than last year during the last Europe debt crisis — still not as good as in the 2004 through 2007 bull market, but much improve from crash levels, and better than last year. 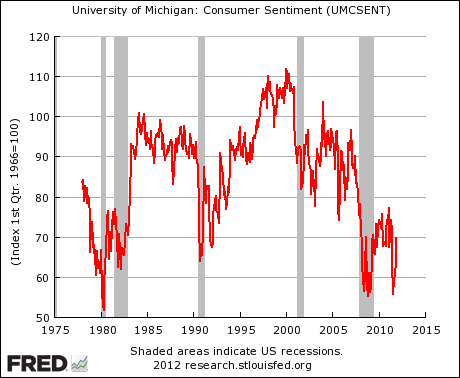 The University of Michigan Consumer Sentiment index has improved substantially this year, although not to levels seen at the peak reached after the 2009 stock market bottom. Households have significantly reduced their debt service burden from 14% of disposable income to 11%, through a combination of debt repayment and refinancing at lower rates. 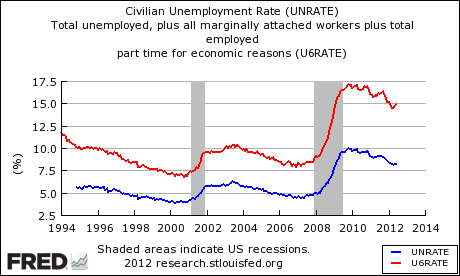 Employment ratios are still not good, but they are improving. 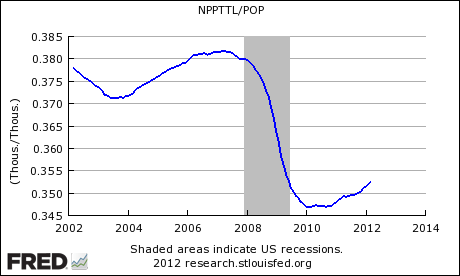 “An indicator of the economic health of the manufacturing sector. 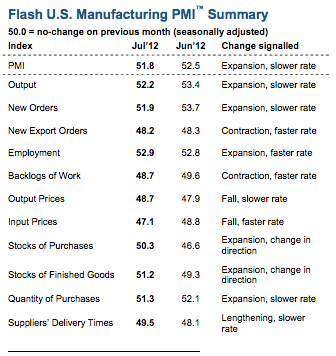 The PMI index is based on five major indicators: new orders, inventory levels, production, supplier deliveries and the employment environment. 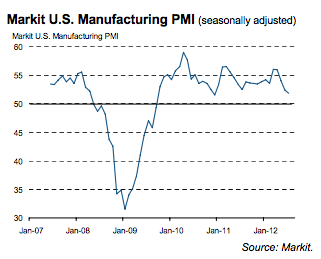 The US is softening, but the index is still above 50 — we’re still growing. Overall, the indicators above paint an OK picture, with some ragged edges. 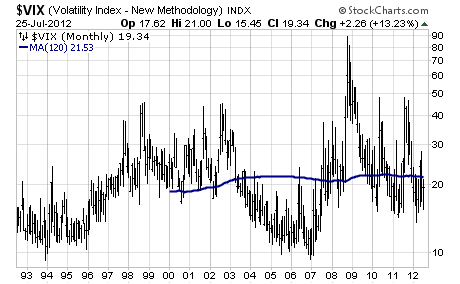 The S&P 500 stock index (1) is still in an up trend (the gold line for the 200-day moving average), (2) is in the middle of its 3 month price range (the upper and lower blue lines), (3) is well above the bear market threshold (the read line 20% below the trailing one year high), and (4) presents a price probability range out to 12/31 2012 based on 6 months of historical volatility that is above the bear market level at the lower end of the range. The black line price probability cone is based on an 80% probability, and the green line probability cone is based on a 90% probability. 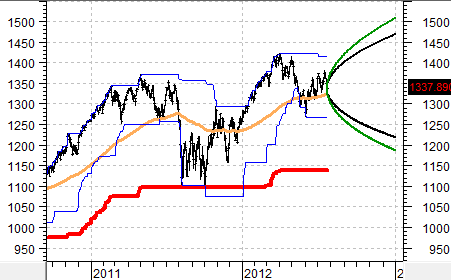 That is with 80% or 90% probability, based on past volatility, the price is likely to remain within the cones. No reason to head for the hills at this time, but also no reason to go whole hog into risk assets given the uncertainty and event risk we face at this time. 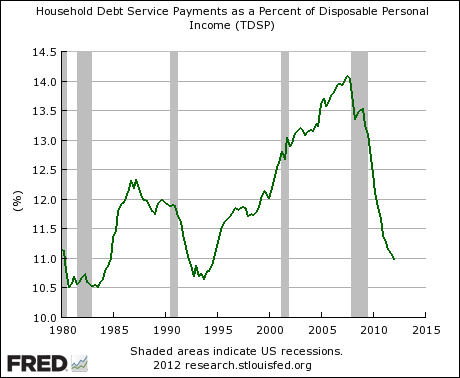 This entry was posted on Wednesday, July 25th, 2012 at 6:41 PM and is filed under Interesting Charts. You can follow any responses to this entry through the RSS 2.0 feed. Both comments and pings are currently closed.